This dramatically passionate waltz has all the presence of a Mandolin Ensemble and the power of a Mandolin Orchestra. John Goodin, esteemed classical and bluegrass mandolin player, wrote the piece in January of 2002. Iowa had a good thick snow cover that winter and he tells us that his tune depicts a nice snowy feel. In this tune, the whimsical melody captures the industrious gait of our feathered friend, the duck. Dennis wrote this piece to feature the lower registers of the mandolin family; the octave mandolin, mandocello, and cello. We've played waltzes, tangos, galops, and fox trots. Now we've accomplished a waddle! Nancy's timeless melody features the bowed instruments. It was originally written to be played as a bridal processional. 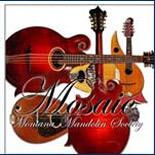 Like a lot of The Montana Mandolin Society Music, it works well for a variety of occasions. This piece was transcribed by Richard Geisler in his International Collection. Nearly every culture in the world has a stringed instrument similar to the mandolin. This piece features the cello and the mandocello in a chamber music setting. Inspired by Vivaldi, one of Jesse's favorite composers, it was written during some free time in Portland, hence the name. Written in Cincinnati Ohio for choral or glee club concerts, this controversial song was very popular before the civil war. It was heard in numerous versions around the world. Stephen Foster was known for borrowing traditional melodies that he heard African American workers perform. Many of his melodies reflect those influences. This Brazilian Waltz was transcribed by Jeff Dearinger. We discovered “Alma” when it was played by the en-masse orchestra at the 2001 Classical Mandolin Society of America in Bozeman. Lindsay Turnquist learned this version of the Venezuelan Waltz from a recording by Tina Bergmann and The Bergmann Brothers. The title translates into “The Departure”. Lindsay's dulcimer leads this piece while Craig Hall's classical guitar and Michael Blessing's percussion add the textures to it that makes us want to dance. This five hundred year old Japanese Folk song tells the story of a young girl sold into slavery and forced to raise the children of a landowner. Each verse in the piece reflects a different time in her life. Our thanks to George Winston for suggesting we prepare “Music Box” from his FOREST album for our Japanese Tour. This composition is part of the soundtrack for the Ken Burns film documentary "Prohibition"! The word Hippodrome means 'racetrack' and was made popular by P.T. Barnam's track that ran around the arena under the Big Top. Imagine the excitement watching regal horses, lumbering elephants and even bicycles race around. This galop captures the fast pace and circus like atmosphere. Dale Evans sang this number in her first appearance in a Roy Rodgers Western “The Seniorita and the Cowboy”. The tango has been played a number of ways depending on what culture it was performed by. Michael Blessing playing the percussion rounds out the rhythm in this mandolin ensemble. According to the library of Congress,the oldest known fiddle tune is Soldier's Joy. This is Walter Carter's variation. It is hard for some people to play this song without a banjo!